Brazing processes offer enhanced control, adaptability and cost-efficiency in the joining of materials. Unsurprisingly, this has lead to great interest and investment in the area. 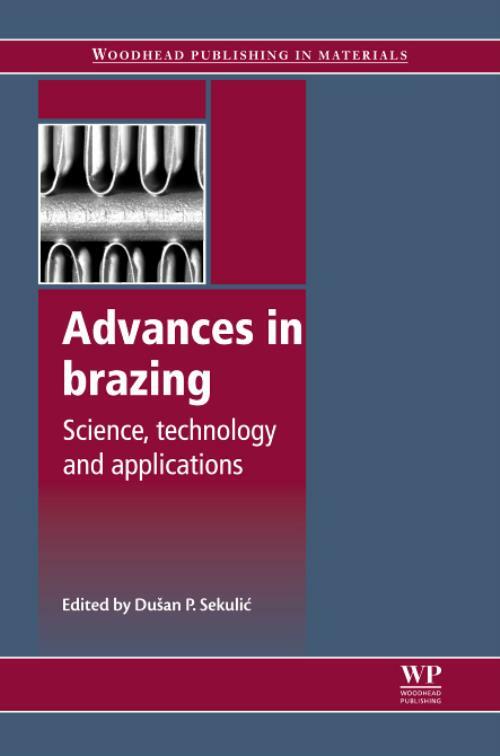 Drawing on important research in the field, Advances in brazing provides a clear guide to the principles, materials, methods and key applications of brazing. Part one introduces the fundamentals of brazing, including molten metal wetting processes, strength and margins of safety of brazed joints, and modeling of associated physical phenomena. Part two goes on to consider specific materials, such as super alloys, filler metals for high temperature brazing, diamonds and cubic boron nitride, and varied ceramics and intermetallics. The brazing of carbon-carbon (C/C) composites to metals is also explored before applications of brazing and brazed materials are discussed in part three. Brazing of cutting materials, use of coating techniques, and metal-nonmetal brazing for electrical, packaging and structural applications are reviewed, along with fluxless brazing, the use of glasses and glass ceramics for high temperature applications and nickel-based filler metals for components in contact with drinking water. Sekulic, Dusan PDusan P. Sekulic is Secat J. G. Morris Aluminium Professor at the University of Kentucky. He is also the Director of the Brazing Research Laboratory at the Institute for Sustainable Manufacturing, which performs research for the development of cutting edge brazing technologies.